Fifteen educators examined the intersections of art and science during the University of Wyoming Art Museum’s Summer Teaching Institute. Each year, the UW Art Museum hosts the Summer Teaching Institute, which focuses on object-based learning using artwork on display and work from the permanent collection. This year’s institute, “Transforming Learning: Investigating Art and Science,” was June 21-23. The Summer Teaching Institute provides educators with hands-on experience and insight into current research happening in art and science, as well as research-based methods for integrating these disciplines. Using current trends in education, which include a focus on active learning in STEAM, or science, technology, engineering, art and mathematics, the UW Art Museum partners with different organizations to reach a common goal. This year’s partner was the UW Biodiversity Institute. In-service K-12 science teachers, art teachers, general classroom teachers and community educators participate in this professional development opportunity, with options for Professional Teaching Standards Board credits or UW continuing education credit. This year, participants examined artworks from the UW Art Museum’s permanent collection, guided by Katie Christensen, curator of education and statewide engagement, and Heather Bender, master teacher; explored African cichlid fish through the research of evolutionary biologist Catherine Wagner; and engaged in active-learning exercises that studied basic concepts in evolutionary thinking, led by Brian Barber and Dorothy Tuthill of the Biodiversity Institute. Participants also worked with two studio artists: Adrienne Vetter, interdisciplinary sculptor and installation artist, and Bethann Garramon Merkle from the Wyoming Migration Initiative. Casper -- Kathleen Backman, Southridge Elementary School; Staylee Brown, Cottonwood Elementary School; Paul Kasza, Kelly Walsh High School; Amy McCormick, Summit Elementary School; and Henry Washnut, Fort Caspar Academy. Cheyenne -- Cindy Bruder, St. Mary’s School; Ronald Morgan, Hobbs Elementary School; Tara Pappas, Wyoming Arts Council; Michele Ragaglia, Central High School; and David Winsch, Sunrise Elementary School. Cook, Wash. -- Jennifer Talbott, Mill A School. Evanston -- Denise Baker, Horizon Junior/Senior High School. Laramie -- Cassa Hollenbeck, Linford Elementary School; Jennie Lawrence, Whiting High School; and Roxanne Raben, Cathedral Home for Children. For more information, call Christensen at (307) 766-3496 or email katie.christensen@uwyo.edu. 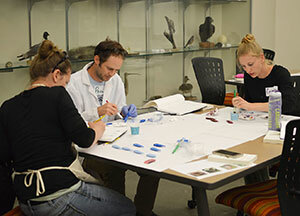 “Museum as Classroom” is a guiding principle of the UW Art Museum’s programs. Located in the Centennial Complex at 2111 Willett Drive in Laramie, the museum is open Mondays through Saturdays from 10 a.m.-5 p.m. Monday hours are extended to 7 p.m. February through April and September through November. Admission is free.